Everyone knows of the Bermuda Triangle. Not many know of the mysterious area just off the coast of Ukraine that has also suffered a number of strange activities. Various disappearances have occurred in this area which some call the Black Sea’s Bermuda Triangle. Others, not so swayed by superstition, also use a similar phrase to describe the politics of the area. In their paper, “the Black Sea and the Frontiers of Freedom”, Ronald Asmus and Bruce Jackson called that region “the Bermuda Triangle of western strategic studies”. It is an area of confusion, forever (or so it seems) bound up with the history of Russia. Russia’s history is one of suffering and hardship. Its people are hardened by centuries of serfdom, relative poverty and rigid rule from the centre. It is also a history of power and control: from well before the first of the Tsars (Ivan IV) through to the Romanovs, via Lenin and the short-lived Communist regime to the present day. In the West, even after so many years, we misunderstand the core drivers behind the leadership and the people. Russia changed dramatically after the 1905 Revolution and then the October Revolution of 1917 into the expensive experiment that was Communism. Marxist thought was “developed” through Lenin and Stalin into a model of dictatorship that, whilst a complete political change from before, continued the power to rule from the centre. The fall of this elite in 1979 under Gorbachev was an opportunity to ally Russia with western thought on democracy and economics but the power of libertarian economics was too much. For a time, the rush for economic power was electrified across Russia as an elite (the Oligarchs) wrested the power of the economy from the State. The new gangster rule – hugely corrupt, murderous and allowing no opposition – took over from the endemically corrupt regimes that began with Stalin and his underlings. Yeltsin enabled this robbery and corruption by his lethargy and inability to rule a people that prided itself on central control. The West, misunderstanding the rigours of power in Russia, stood by hoping that the new economic opportunities would, somehow, generate a desire for democracy. But, market economics does not need democracy to survive (viz. China) and the Russian economy was not becoming a market economy but a new kind of centrist yet libertarian economy: one that was predominantly corrupt (hugely corrupt) and where individual centres of economic power (whether oligarchs or regional centres) dominated. This new economy was, for a time, the true government of Russia. Vladimir Putin came on to the scene relatively late but enshrines the old order of (mis) rule. He made his way to the top by promising an end to economic shambles and strong centrism in terms of government. The years of Gorbachev and Yeltsin are seen by him (and many Russians) as a disaster – leading to governmental shambles, a loss of Russian honour and an economy shared out between a few ruthless gangsters. Putin has worked to centralize government to himself (the new Tsar) while piecing together an economy based on market basics but which remains heavily unbalanced by corruption and key centres of economic power. This Triangle of Tsarist mis-rule, corruption and economic centres of power are not dissimilar to the pre-communist set-up. It is a reversion to the norm in Russia after communism and the Gorbachev-Yeltsin period of chaos. It is a reversion to what Russia knows best and what its people are still willing to accept – knowing that they cannot have any power of thought, that they will be ruled from the centre both in terms of economics and in terms of the way they live; knowing that corruption will endure and that they will be OK as long as they have enough to get by on and keep quiet. It is a world where the Duma has resumed its original status – merely as an organ to assist the ruler – the Tsar (Putin) – rule. The world’s heartbeat of communism pulsed in Russia and China. Both countries suffered tremendously for the experiment of their own type of communism – Lenin-Stalinism or Maoism. Both have now moved towards what we perceive as market-driven economies. We (the West) think that our form of economics has won out in both countries and that democracies will automatically follow. Unfortunately, both models show how market-driven economics can be developed in different ways and to suit the ruling elites. China operates as a legalist society whereby the ruling elite sees itself as above the law. This is a blurring of its communist ideology whereby the state is run for the benefit of the ruling ideology. The fact that communism no longer exists means nothing: a ruling elite is considered by itself to be above the law. Of course, the economy is managed very differently to how it was managed under Mao. Deng changed this to entwine market forces within a rigid centrism – made real by ownership of the banks and finance and of key industries and resources. While most pricing mechanisms are set by the market, it is massively influenced by interest rate manipulation, by endemic corruption and by key units of power in local government – and by the family-focused culture. This is a mix of market economics, centrism and Confucianism that is uniquely Chinese. This is wholly different to the Russian model which is far more dominated by the strong man culture. In this way, it could be argued that there is more hope for change. The intertwining of Confucianism with the long-term centrism of Emperor rule through to the Communist rule and now the post-Communist legalism makes China’s “Civilisation State” very hard to break down. Economic change was relatively easy as this was only communist for a relatively short period. Governmental change is far harder to crack. In Russia, this may be true as well but there is no equivalent of Confucianism in Russia and the state apparatus is not as broad in Russia as in China – it was destroyed under Gorbachev and Yeltsin. So, in that short period, the West hoped for real change. Now, Putin has embodied the state apparatus in himself as Tsar. Putin’s aspirations for a renewed Russia have seen him march into the Crimea and undermine Ukraine. Ukraine was for many years just a smaller version of Russia in Russian minds – Ukainians were termed “Little” or “Southern Russians” in the 19th Century and Stalin saw them as a tribute nation (similar to the way that China views its neighbours). The Russification began in the 1860’s and it was only the fact that Kruschev was Ukrainian that gave them a measure of independence (and Crimea) around 40 years ago. But, Ukraine is similar in other ways, too. It is endemically corrupt from the top down. It is not just IKEA that has found the corruption difficult to penetrate. Ukraine has seen endemic and high-scale corruption for many years. In 2006, for example, Global Witness (an anti-corruption NGO and this year’s winner of the TED award) published “It’s a Gas” – an expose of the corrupt Turkmenistan – Ukraine gas trade. The report highlighted the case of former Ukrainian Prime Minister Pavlo Lazarenko, who, it claimed, syphoned off huge amounts of money from questionable business practices: money that was then funneled into Swiss Bank accounts. Lazarenko (who served time in the USA) recently had substantial assets seized in the US. The Global Witness report also highlighted the barter economy which anti-corruption experts know as one of the best-known ways to hide massive money transfers illegally. Yet, Lazarenko was not part of the Government clique that Ukrainians pulled down earlier this year. He was closely linked to the earlier regime of Yulia Tymoshenko (the West’s best friend) – very closely linked as an article in January showed. Those in power in Ukraine followed the Russian model. Little Russians modeled themselves on Russia in many ways and this was not limited to one party or one clique. The EU desire to bring Ukraine into the EU tent was not necessarily misguided in the way that Nigel Farage would have us believe but the powerful in Ukraine are essentially part of a highly corrupt clique that dominates the country in the same way that Russia is dominated by its own corrupt. They have divided up the nation’s assets between them. This is one reason why Putin is keen to bring Ukraine back into Russia’s control. The horror of the break-up of the Soviet Union was bad enough but assuaged by the economic benefits that accrued to the Putin elite and the retention of power in the hands of the few. This was mirrored in Ukraine – the home of many Russians. The call to patriotism has been partly a response to the shouts for democracy but underneath is a need for Russian mores to be maintained. 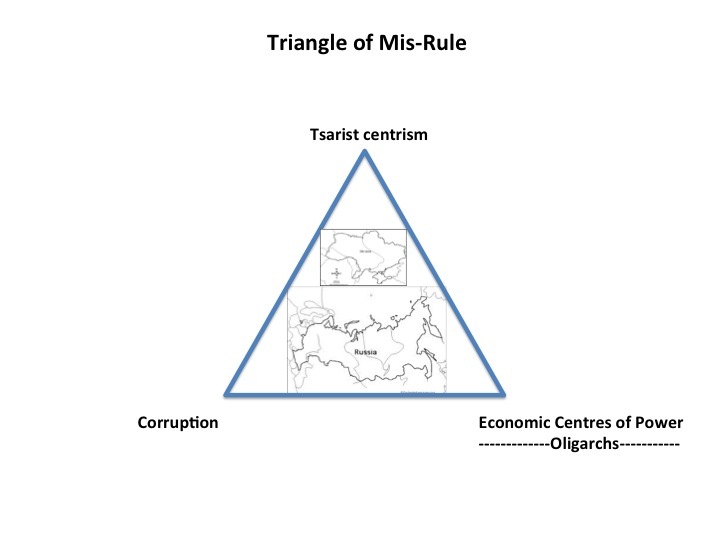 This is the Triangle of Mis-rule: Tsarist centrism, corruption and economic centres of power that Ukraine has witnessed since it was deemed to have left Soviet control – an exact image of big brother Russia. This is why it is so difficult to break down the stranglehold. Ukraine is fixed within the Bermuda Triangle of the Black Sea. The EU may well have been Tsar Gazing when it simplistically assumed that riots on the streets could topple a government in a bankrupt nation with such a history and such conventions. It appeared not to understand enough about the pull that Russia had on it: Russification going back over 150 years and a model of the economy and government that is a replica of the Russian model. Breaking this down was bound to be a challenge – but it is not clear that the model is sufficiently understood even now. Many write on the endemic corruption but provide little guidance to solving it. Many write on Russification but have no answers other than a hope that “democracy” will triumph. Others write about Putin’s urge to control without too much understanding of the Russian legacy that goes back to the 15th Century. It is not just one aspect or another that has to be broken in Ukraine. They have the three corners of the Triangle of Mis-rule to break in addition to the large numbers of Russians – patriots to Russia – in their midst and the larger numbers just over the border in Russia itself. This is a massive challenge and there is no rapid solution. Ukraine is in a mess – as we know. It has lost the Crimea and may well lose the Eastern half of the country. It is not often stated that this may be the best medium-term solution even if it is not one that appears wholly palatable. A loss to Russia of this scale may appear too much and it is, of course, for Ukraine and others to decide. But, the devil’s triangle that operates in Russia and Ukraine is endemic to the Eastern side of the country in a way that could be shaken off more easily in the West. The unthinkable may have to be thought. Without much effort, Putin could regain the Eastern side of Ukraine and the West of Ukraine would then be welcomed into Europe. It is highly likely that governments in the West are already planning for this. As ethnic Russians pore into Ukrainian security buildings, it is clear that the fight for Eastern Ukraine is in its early days. The Western half can, through massive economic help by Europe, be purged of corruption, centrist rule and economic stagnation. Without the East and as part of Europe, it can be made good. While it remains affixed to the Russianised East, it is unlikely to do so for many years. Russia is likely to see eastern Ukraine back in its orbit and remain enclosed with the Triangle of Mis-rule that epitomizes both. What happens after that is something that is also, I am sure, being actively discussed in governments throughout the world. The problem is that nothing will really have changed – Putin’s Russia is endemically riddled with forms of entwined government and economics that are alien to modern-day Europe and the west in general. Changing this will take a long time and Putin, a fit 61 year-old, is in no mood to give up all that Russia provides to him. To an extent, the rest of the world will play a waiting game with Putin. In Ukraine, it may have to understand that Plan B (the break-up of Ukraine) is a potential and real outcome. Maybe, over time, Eastern Ukrainians, bordering an economically advancing Western Ukraine, will begin to appreciate the benefits of freedoms brought by the rule of law that is above all (including government), economic freedoms that are not concentrated in the hands of the few and democracy that can (when done properly) do away with bad government. Maybe, over greater time, Russia (and China) will adapt as well and copy not just the basics of market economics but much more. For the rest of us, understanding the Triangle of Mis-rule would be a good step before the results of misunderstanding are yesterday’s news. Active Re-branding or leave it to do-gooders? Henry Porter, writing in The Observer on 8th September about the Snowden affair, calls the British people “complacent” in its attitude to secrecy. He is concerned that the BBC’s Today programme on the previous day did not cover the subject recently when he believed it should have been a leading item. In the UK, as we hopefully begin the escape from one of the worst recessions in history and where wages are, Iike in the US, still falling behind prices despite renewed growth in the economy, there is a mistiness amongst the population that is likened to Huxley’s Brave New World – where many of us appear to be high (or low) on Soma. The Soma of the 21st Century is, maybe understandably, related to wealth– the money we earn that gets us through life. It pays our bills, buys our food and clothing and shelter, pays our tax and is almost everything most people think of as their main route to wellbeing. For almost all, money seems to form the basis of our lives and engulfs our thinking. For money appears to be at the heart of everything the 21st human believes in – lack of money effectively disenfranchises us from most of life’s gains. Lack of money dis-enables. Maslow got it right to a point. We are all focused on the lower levels of his hierarchy. The trouble is how enough of us penetrate the upper layers. 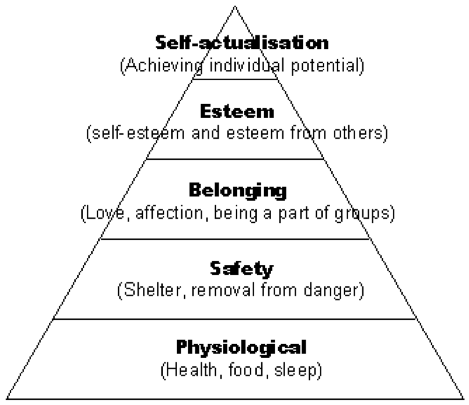 We seem to get the shelter and food parts, even the desire to belong and group ethics; but, once we get to esteem we believe that this relates to work and jobs and self-actualisation is well beyond almost anyone anyway. Working to the common good, for example, is maybe a stretch too far. A recent survey shows that “only” 9% of us actively participate in civil society – working for civic pride – maybe being self-actualisers. The Charity Aid Foundation (CAF) found that just 9% of people give 66% of all the time and money to charities / not for profits in the UK. See report. The “civic core” – a concept first espoused by Mohan and Bulloch in 2012 – drives the charity sector. The “zero givers”, as the name suggests, relies on them to be the “do-gooders”. I am reminded of the days when Schools’ Boards of Governors were obliged to meet with parents annually. I cannot remember one occasion when, I as one of the governors, was confronted by an audience larger than the school governors present. For a school with over 1,000 sets of parents and guardians, possibly 10 people would turn up. No wonder this annual ritual no longer exists. Most people want to engage with themselves and their families and not with the wider community – let the civic core do it. This reflection on society may seem overly harsh but does shine a light on Henry Porter’s concerns about society being “complacent”. Except in times of abject misery – like a time of war – most of society is not complacent but reliant. Reliant means that the vast majority of people looks to the civic core to run the core of society. CAF senses that much of this is down to time-poverty – or lack of time to commit to other things. Is this really true? Are 91% of the population lacking time – or is this an excuse? Maybe there is no sense of the Big Society that David Cameron no longer mentions. Maybe we are individualists that rely on the rest of society where it counts – where priorities like secrecy issues are well down the list. Re-branding society is a challenge – a call to inaction or action? Of course, 9% of the adult population actually represents a lot of people – around 9% of 50 million – which is 4.5 million. According to CAF, 4.5 million are actively involved – the civic core – who are not so time sensitive. A high proportion, though, are over-65’s and there are many more women than men, less full-time employed, less young people. The challenge to which Henry Porter alludes is how to galvanise sufficient of civil society to make a difference – in an age where not enough of us commit to anything other than ourselves or to our close kin and friends – or, maybe to the ultra-loose contacts on Facebook or Twitter, where a retweet has somehow become our idea of “campaigning” and close friends are indicated by the number following you on LinkedIn or Facebook. An indication of this is an excellent article by none other than comedian Russell Brand writing in the Guardian – 13th September. ” …For example, if you can’t criticise Hugo Boss at the GQ awards because they own the event, do you think it is significant that energy companies donate to the Tory party? Will that affect government policy? Will the relationships that “politician of the year” Boris Johnson has with City bankers – he took many more meetings with them than public servants in his first term as mayor – influence the way he runs our capital? Is it any wonder that Amazon, Vodafone and Starbucks avoid paying tax when they enjoy such cosy relationships with members of our government? Ought we be concerned that our rights to protest are being continually eroded under the guise of enhancing our safety? Is there a relationship between proposed fracking in the UK, new laws that prohibit protest and the relationships between energy companies and our government? This may well be heartfelt but the essence of Brand’s words seem to me to be passive – a plea not to trust politicians, big companies and the media: heartfelt but inactive; a plea to do nothing – to be mournful, sad about the exploits of others but certainly no call to action. It is a call to inaction. Maybe he is too busy to use his fame for good causes; maybe Russell Brand is more interested in having a few laughs with his mates. But, if someone as intelligent and thoughtful as Brand can’t rouse himself to do anything, to get involved somehow, what do we expect from the rest of the 91% (or even most of the 9% who, while involved, are certainly not out there campaigning or even showing annoyance or being pro-active)? When many don’t even vote or even consider it necessary, we know that democracy is not in a good state. But, voting is a passive demonstration even if critical to a democracy. Most do not enter into a debate on issues outside their very close domain – sport and the weather seem the height of discussion in this country. Or, many get high on celebrity – X Factor or Big Brother. Former News of the World readers now tweet obscenities or attack feminists. So, issues like secrecy or tax havens (important to some) somehow seem trivial when prices are rising above the rate of wages and when good, full-time jobs are hard to obtain, when the trivial becomes all-important. Maybe there is a catalyst out there that will encourage more to raise the temperature of debate and even to join in an active capacity. I have seen it at work. Organisations like Global Witness (where I was fortunate enough to work for close on five years) are full of young, impassioned, intelligent people who work hard to make real change happen. Whenever a job vacancy was advertised, there were often hundreds of applicants – from top quality people itching to get involved. There is a strong undercurrent of capability in the UK (and elsewhere) of well-educated, strong-willed people that want to pro-actively work for a better future, who are not complacent and not reliant on others. Maybe we need to get them to talk more about what they do – not just to governments and politicians (who, in the short-term, are the change agents) but to young people in schools and universities – who are so focused on jobs and wealth (which is fine) but who may also want to ensure that society is properly balanced. This balance is not away from wealth creation (which will remain a fundamental underpinning of our society) but towards wealth creation that we all feel good about and where we do understand that money is not the only thing: wealth being quality not just quantity. Maybe Russell Brand could get involved in this way – using his enormous power of communication to pro-actively make people want to get involved. From an inactive mournfulness to pro-active catalyst – a re-branding that makes sense. Six years on from the bank-induced recession, governments in the G8 are in Enniskillen, Northern Ireland to consider problems that they have failed to solve since the invention of taxation. While not as old as Enniskillen’s oldest building, built by Hugh “the hospitable” Maguire (who died in 1428), it is high time serious politicians acted. Large sovereign deficits (spendthrifts pre-2007 and financial system saviours post-2007) and the inability of Finance Ministers to take more tax from their citizens has caused some nations to focus their attention after hundreds of years on the anomalies of the corporate tax system. This system enables companies (tax dodgers) to shift their tax burden offshore – away from where they make their money – through transfer prices, royalties and the like to places where the tax burden shrinks to almost nothing. Margaret Hodge (the chair of the UK Parliament’s Public Accounts Committee – PAC) has pursued a fierce campaign against large companies that have, in her view, not paid their due corporate taxes in the UK. The HMRC (the UK’s tax collectors) have, for many years, decided to be “pragmatic” and reach deals with those same companies on the basis that tax law is insufficient to compel the larger companies to pay reasonable rates of taxation – and the companies have more and better (and better paid) tax lawyers and accountants than the HMRC could dream of. The PAC has not accused companies of illegality but has stated often that they should pay tax where they earn profits and has cast doubt on the companies’ honesty and morality. Google claims its sales take place in low tax / tax haven Ireland despite the reality of closing the deals in England – as the PAC has claimed and has brought forth witnesses who have testified to this. What the debate between public and private sectors have shown is clear (to most of us). It is that corporate taxation is very hard to collect currently and that companies believe they are duty bound to reduce their tax to the minimum possible. For there is no social heart in a company – it is not really a person (even if it is granted that status in law), it has to meet the demands of the legal system and its shareholders (while ensuring its customers are satisfied on the way). There is a misinterpretation that great companies can find a soul but we should understand that, while they are all made up of real people, companies (especially large ones) take on a life of their own and are propelled by the dynamics of corporatism. A company knows that it has but one existence – there are no stories of “good” companies going to heaven. Companies that pursue good CSR (corporate social responsibility) do often have good people working for them but the CSR is there because civil society (which includes a lot of customers – real people) demands it. Sustainability is best developed with a good understanding of the society around the company. This means understanding social responsibility where it is seen to be legally needed or where it will benefit the company in the medium term. This rarely stretches to paying more tax than is needed. For every Starbucks (frightened by bad publicity to throw money in the direction of HMRC) there are 1,000 Googles and Amazons and Apples. Tax is not for sale and paying tax not required by law does not gain a company angel’s wings. However, since 2007, there have arisen massive deficits in many sovereign nations’ coffers. Suddenly, there is a need to fill those cavernous holes and the substantial drift in the share of income from individual wage earners to high net worth individuals and companies (companies don’t have a vote – outside of the city of London and there are not that many rich people – even if they control most of the wealth) means that the attention of government has shifted in times of recession. Angel Gurria, Secretary General of the OECD, said recently that taxing the “man on the street” wasn’t economically desirable or even politically possible, so for many finance ministers the only option was “to cut, cut, cut more, rather than have a proper balance between revenue and the expense”. He said this while overseeing the signing by more countries of automatic exchange of tax information – Austria, Switzerland and Singapore coming to the table. However, other than austerity, which is now causing huge unemployment in countries such as Greece and Spain, the only target is corporate. This may be a turning point after hundreds of years – a Clause 4 moment – or it may be just rhetoric. Linking this to the G8 and David Cameron is obvious. Companies are able to avoid tax if they can somehow show that their profits are made outside of the higher tax areas. This can only be done if there are places with very low taxation that will accommodate them – these are the tax havens. Nicholas Shaxson’s excellent book “Treasure Islands” tells the story of these tax havens extremely well and also the appalling impact that they have on the poorest countries of the world. Developing nations are rife with corruption and the corrupt are big users of tax havens – really, they are laundering their money. Today’s Sunday Times article on the use of Latvians as front Directors for companies operating scams tells this story. This is possible because of the secrecy that exists in most jurisdictions. If there was transparency and the only issue was lower taxation, then we would have a real competitive environment. Unfortunately, that is not the situation – although it is changing quietly with projects like the one above. If transparency becomes the norm, then the corrupt and criminal (whether they are terrorists or drug barons) will have far fewer places to go. There is no better place to learn about beneficial ownership than at Global Witness – which has driven this issue from the start – see their “Idiot’s Guide to Money Laundering.” It’s so easy anyone can do it – trouble is, most are! This is why transparency is so critical and why politicians are attempting to use transparency to open up tax havens – at last – and the end to ownership secrecy. Once there is transparency, then the next step is to determine where profits are legitimately made. This means that the policing of royalties and transfer pricing cannot be at the whim of large corporates but there has to be international agreements that specify what is allowable. International tax laws should not predetermine rates of tax, but double taxation should not equate to zero taxation – it has to mean that tax is payable in the countries where the business is done. The final requirement is to ensure that beneficial owners of companies are known by the taxation authorities. Why companies and trusts are allowed to be secret is beyond the comprehension of almost all of us. As Richard Murphy (Tax Research UK) has written, over 500,000 companies in the UK are struck off each year. Around a third never file accounts. He estimates that the tax lost as a result could be upwards of £16bn per year from companies that trade but do not file accounts or tax returns. That is in the UK alone. The dilemma of western Governments that find austerity too much, too soon and who (outside of those in serious trouble like Greece, Cyprus and Spain) are unwilling to torment their citizens with mass unemployment and soup kitchens is great. This means that the deficiencies that have been all too apparent in corporate taxation for so long are seen as the final option. The 2007 banking-induced calamity has made such huge financial contortions in countries such as the UK and the USA that even the precious not-to-be-disturbed tax havens and secrecy laws are under pressure. The G8, chaired by the UK and in Northern Ireland (rather than one of the many UK protectorates that operate as tax havens), does provide an opportunity to generate support for the ending of the nonsense that the current corporate tax system provides. Gleneagles (eight years ago) was all about international development and led to significant and positive change (even if not all the promises have been fulfilled). The same pressure and openness about tax havens and secrecy in international finance could lead to more sensible and pragmatic tax systems and, eventually (if pursued vigorously) to far less exporting of illicit funds from developing nations (such funds leave developing countries at a faster rate than aid money is put in). At least $50bn a year is lost to developing nations in Africa alone every year. This is a great time for Enniskillen – ancient home of Hugh the Hospitable – to be remembered for its lack of hospitality to tax dodgers. The Question: as the gap between elite sport and its fans grows ever-wider, should those who pay for the sport (its fans) expect to have a say, should the communities on which the clubs and associations depend be better treated by those at the top and, if so, how? Many of us have a love affair with sport – many play it directly and millions watch sport and maybe actively or passively support a team. Sport underpins many of our lives – it makes us fit and provides excitement, motivations, inspiration, team-building and social cohesion. As the 20th Century went on, professional sport was progressively distanced from the amateur and the fan by its takeover by business interests – initially, the local businessman but later, by international business. This provides a distancing of ownership from the mass of people that generate the income in an industry that is unlike so many others: where the customers are so involved, often so passionate, often players. This means that sports authorities (and especially businesses that own the major teams) have a responsibility that is different to other businesses or business organisations. They have a duty of care to their customers around the “game” and how it is played. This opens up the issue of how individuals (or groups of individuals) who are customers can be “played” because of their commitment and what can be done to protect them. There may be lessons for all industries from the examples available. Governance is much wider than this in regard to sport and its impact in and on society can be shown by three articles in The Independent (Saturday, 18th May) that highlight the difficult interconnections between business and sport (here, England football teams) and the intertwining connection between sport and the community. · The first by Chris McGrath attempts to show the worst side (Manchester City’s owners sacking of Roberto Mancini) and the best side (the Portland Timbers superb response to a charity – Make a Wish – for help for an eight-year-old cancer victim). · The second (in the business section – Jim Armitage) reflects on the Arsenal blog that shows the support of Doan Nguyen Duc (a wealthy timber merchant from Viet Nam) for Arsenal and questions whether they should take the support (financial and otherwise) from someone that Global Witness (an anti-corruption NGO) says was responsible for much of Viet Nam’s destruction of its forests and the displacement of many people that lived there. He is said to have made the comment: “I think natural resources are limited, and I need to take them before they’re gone”. · The third (also in the business section by Simon Read) reports on how Sheffield Wednesday turned down a deal with a “payday lender” which it refuses to name but was said to have offered 25% more than anyone else. The three articles (I assume “coincidentally” in the same newspaper on the same day) highlight the mistrust of journalists for the businesses behind the clubs but also for the type of ethical questions that the clubs have to consider at this time. “This time” means at a time when business and the community is undergoing strains and, in football, when the position of a team as part of the community it serves is strained to the full. In the USA, big teams moves State; in the UK, only smaller teams like Wimbledon (now Milton Keynes based) have tried it as fan bases are crucial to the business (even if more revenue than ever is via TV and international support). It is a long time since amateur sport ruled anywhere (the top tennis players rarely joined the professional circuit until well into the 1960’s; athletics was similar and rugby became professional in the UK in the late 1990’s). In the UK, football was severely structured with maximum wages well into the 1960’s as well and even if clubs were limited liability companies, they were owned by local families who kept them private. In those days of amateurism, sport was for the community. Players were not paid much (outside the USA) and players were close to those they played in front of, living in the same streets and drinking in the same pubs and clubs. In the USA, football, basketball and baseball (and ice hockey and the rest) became business pursuits earlier. Europe and the rest of the world (and most sports) have followed. It is now the normal way of life that business had taken over professional sport to the financial benefit of players and (mainly through TV) the income for sport worldwide is now massive. Whether the Olympics, football (through FIFA and its major tournaments such as the Champions League and World Cup), the Superbowl, 20:20 cricket in India and so many more, sport now generates massive income through its massive fan base and the ability of TV to generate that income. So, there has been a rapid shift by large businesses and entrepreneurs to own sports team and have influence over the organisations that manage sports – such as Formula 1 or baseball or football (of all types). This income has been generated through the opportunity that sports presents over almost anything else – to transmit excitement visually and aurally through radio, TV and the internet to a mass audience that is entranced by the game played – with an excitement and passion rarely found elsewhere. This mass appeal is now available and reach-able worldwide and with that appeal comes massive advertising revenue (and, with the internet) growth is coming faster. So, sport (something we all get involved in to some extent) has both appeal as participants and observers (although to a greater extent than anything else, the two are mixed with sport). This appeal is then converted into income for companies that are able to transmit sport into the home – via pay per view, rents and advertising. Sky in the UK has become a dominant operator (although BT are now incurring on their territory). Owners of sports teams (especially in football in Europe and all the major sports in the USA) benefit wherever they operate. Because sport is not just another product and because the “customer” is so involved, there is a chance that sport offers something different. The players are celebrities and, in modern culture, people that youngsters look up to (rightly or wrongly). More people know David Beckham than any politician or scientist – it is a (maybe unfortunate) fact. This means that businesses involved in sport (and that means the sports clubs and managing organisations themselves) have opportunities to involve themselves with society that is not there for other businesses. Not only that, but they have a duty because of the nature of their business and for their own protection. This duty can be said to be to serve the community that provides them with the income they derive. This is not about BSkyB or BT doing some CSR. They are the middlemen in all this – the means of transmission. No, this means the sports entities themselves working out how much their “community” means to them and how much they should give back to that community. It can be done. A good example is Arsenal Football Club that has set up the Arsenal Foundation and, in turn, developed real partnerships with Save the Children (its international charity) and Willow Foundation (a national charity). I have an interest here in that I am Chief Executive of Willow Foundation – which provides special days for seriously ill young adults. Arsenal is an international business these days but has worked out that it also has local roots and its Foundation works in the local community and with Willow on a national scale. With Save the Children, it operates internationally. At its recent Annual Ball, Arsenal Foundation raised over £300,000. That maybe small compared to the Football Club’s annual revenue of £226 million in 2011, but it is a start. Moreover, the time and effort of the club and those within it (like Arsene Wenger – an Ambassador of the Foundation) are worth a lot. However, the balance sheet is patchy on sport’s involvement with their support base and through them with the community. There is no real driving force that connects through the massive distance that exists between them. While the same distance exists between many businesses and their customers (banking is a very real example, but the same can be said of energy companies and so many others), there is a very real difference in sport that is both for bad and for good. The business sector has been buffeted by recession and, in such a recession, business leaders and their companies are vulnerable to attack from other sections of society. So, the tax avoiders like Apple, Google, Starbucks and others (all under attack by newly-zealous politicians in the UK and the USA along with the tax havens that they employ) are not just seeing their potential tax bills increase. Their relationship with customers is also under attack that can lead to reduced sales. This may not be the case for Google (now so big and dominant that it may no longer care) but others may well feel the pain. In the sporting arena, it is easy to see a large array of problems: FIFA and football corruption, allegations on racism across the world, NFL alleged behind-the-scenes collusion on player wages (the NFL is a not-for-profit – which may surprise) and the general disbelief that ordinary fans have with the salaries that players “earn”. Football in the UK is an example of the changes that have taken place in the last forty years where salaries of £100,000 per week are not unusual (Gareth Bale is negotiating £200,000 a week at Tottenham) and the difference between that and the average wage in the UK of around £25,000 per year is stark. Taking all this together, sport (as epitomized by the 2012 Olympic Games in London) can be magnificent but clubs and sports organisations have to take notice of the communities upon which they rely. The piecemeal CSR and charitable work should be as competitive as their sport rather than resisted or an afterthought – or done just for publicity. Sport is a collective experience – whether in teams or the association between individual sports stars and their fans. This provides an opportunity to seal the gap between the stars and the fans that small groups of supporters on their own can never fill. The link between the stars / clubs / associations (the elite) and the fans / amateur groups has always been a struggle. It is for each club to decide how it deals with the community upon which it depends. Some ensure the players get into the community – at Tottenham Hotspur in London, Ledley King and Jermaine Defoe are well-known for the time they spend with young, inner-City kids and clubs. Other set up Foundations and / or develop relationships with charities (usually connected in some way to the work they are doing or the area they are in). Deloittes produce an annual report on the top football teams – with the last issued in January of 2013. No one (that I can see) assesses annually the contribution that sport and teams make in society or the potential for that contribution – let alone any analysis on the work individual clubs perform. Business seems now to be the only driver – which is a Rollerball outlook on sport – a dystopian future that may well be here already. Made in 1975, the film showed the world in 2018 as corporate-controlled where sport was the controller – like 1984 with sport instead of three political blocs fighting each other. So the Question: as the gap between elite sport and its fans grows ever-wider, should those who pay for the sport (its fans) expect to have a say, should the communities on which the clubs and associations depend be better treated by those at the top and, if so, how? Bodies such as Sport England, the Department for Culture, Media and Sport and the major associations of all the sports and clubs discuss the wide range of benefits and opportunities that exist. Because it is hard to measure the impact of sport and the part played by big corporations in sport (it is not something easy to measure like GDP), the real impact of large corporations on communities and people in the UK is not assessed. Like the problems of measuring the benefit of a woodland or a river, our focus on numbers (and scores) misses the potential for large sports organisations to do good – and the result is that newspapers see the Rollerball potential. Because of its enormous impact on society and people, one response may be to set up an equivalent in the area of Sport – to assess the benefits and problems associated with the business of sport and the benefits to society, people and communities in ensuring that Sport is well managed for the benefit of as many as possible and that Businesses in Sport gives back to society sufficient of the benefits it derives from those communities and show how they take those communities into account. We would then get to see an Annual Report on the state of sport in the UK. So Amazon, Starbucks and Google avoid tax and British politicians are surprised! So the big accounting firms (KPMG, Ernst and Young, Pricewaterhouse Coopers and Deloittes) follow the banks in Margaret Hodge’s and her committee’s sights. It is pretty incredible that in 2012, after hundreds of years of banking and secrecy in financial dealings that politicians seem to suddenly wake up to the fact that multinational companies move money around the world to save on tax and that wealthy individuals do the same. Have the sleeping pills run out? Is the dreamlike state that they were in for so long worn off like a modern-day Rip van Winkle? All this time, companies have paid large royalties to themselves in low tax jurisdictions, changed prices to do the same, set up secret companies in secrecy-oriented tax havens alongside wealthy individuals and others from the criminal and terrorist fraternity who make the tax havens their home. As wealthy nations like the UK have slept while such as royalties escape our shores (and our tax revenues with them) to the tax havens, we have allowed even more serious crimes to take place – the looting of the developing world of their natural resources through the illegal and morally repugnant ocean of money that gets sent to such secret jurisdictions. Far more money is transferred out of the third world into such jurisdictions annually than we in the so-called developed world push back in through aid programmes: all because we allow the secrecy to continue while we sleep. The talk is about how we extract more tax from corporations and the focus has been on HMRC to review the levels of royalties it allows companies like Starbucks to pay to what appear to be false set-ups in countries like Luxemburg. Starbucks solution is to keep on doing this but to pay HMRC £10m for a couple of years as a gift. Tax avoidance on the scale that we are seeing – tens of billions a year according to experts like Richard Murphy. He shows how little companies are paying (compared to some like Costa Coffee who appear to be paying amounts that equate to their sales and real profits). The problem is that corporation tax is based on profits and, as any good accountant knows, profits are an art form not a science. If there were no secret jurisdictions, then companies would show their total sales and profits (as shifting money inside a company cannot lose it overall – so overall profits stay the same over time) and it would be possible to tax profits based on where the sales were made. Agreements could be made between the nations in which such sales were made on a national scale and by company. So, if Google makes $1bn in profits and 10% of its worldwide sales were in the UK, then it could be taxed on $100m of its profits in the UK at UK rates unless there were good reasons not to – e.g. evidence of excess investments. Of course, the simplest method would be to completely ban royalty payments within a company or connected companies. This would ensure (at least improve the chance that) that real activity and profitability were taxed where they should be. Royalties charged outside the company to another one would continue. Before such a solution takes hold (or something similar – making real change to dual-tax treaties), the tax authorities have to struggle with long-term negotiation with companies on esoteric and mind-numbing issues and governments have to work to destroy tax havens and secret jurisdictions. HMRC are involved in the first but the progress on the second seems to take place on a geological timescale. Secrecy is the friend of tax evaders and avoiders. Being able to hide the actual transactions that take place is often the cornerstone of tax minimization. This is why it is so important that the current discussions between the Isle of Man and the British government on opening up all the former’s bank account to UK investigation is so significant – even if just a start. Richard Murphy estimates that this will open up 99% of such accounts. Good start but hardly the whole picture. As Nicholas Shaxson has written in his book Treasure Islands there are many tax havens in the world from the Channel Islands to Delaware and from Cyprus to the Virgin Islands. Each one enables secrecy of accounts and company ownership that does not just delay the ability of tax authorities to open up the information but stymies it completely in many cases. Global Witness believes a further dramatic change is required: the identities of the real, ‘beneficial’ owners of all companies should be publicly available in the country they are incorporated, and nominee directors and shareholders should be held liable for their clients’ actions. The EU has the opportunity to take the lead on this over the next 18 months as it updates its anti-money laundering laws. This matters because ‘shell’ companies – entities that are little more than just a name on a piece of paper – are key to the outflow of corrupt money that keeps poor countries poor. Those who loot state funds through corruption or deprive their state of revenues through tax evasion need more than a bank: they need to hide their identity behind a corporate front. Countries such as the UK might have a company registry and consider themselves ‘onshore’, but as long as they only collect shareholder information, they are effectively permitting hidden company ownership – which means they are as offshore as any palm-fringed island and will continue to facilitate corruption, tax evasion and other crimes. This needs to change. Their investigations showed how easy is was to set up false companies (in one case with a director who was no longer alive) which would often not operate but to which financial transactions would be placed – disguising the remittance of funds from one jurisdiction to another. Money laundering of this type is thus rampant internationally. This is not much different from the tax avoidance of legitimate companies who, arm in arm with politicians and tax authorities, have been sleep walking to the current position. Now, with so many countries deep in recession and with Governments indebted and working hard to stay financially afloat, the general public is angered at what seems to be the slanting of tax benefits away from those who are working hardest to those who manage money and financial flows. Secrecy has bred tax opportunism and money laundering and it is right to conjoin those terms even if in law they differ. While the recession keeps its grip on the western world, there will be no let up on the public’s desire for some better form of equality whether against the wealthiest 1% or the top companies who control most of society. This equality of outcome – paying the right tax for the benefits that accrue from the nation that houses that company (such as roads, police, defence forces, education and the like) – is a central theme for this recession. To become transparent is the requirement for the 21st Century and especially during the economic downturn. The internet has given us all the ability to learn what is happening within seconds and to act on it. So, Starbucks is today hit by demonstrations despite its ploy of giving a charitable donation to HMRC. However, real transparency will require the ending of tax havens, the ending of impunity for those who are guilty of money laundering and for those who enable it (whether lawyers, firms of accountants or banks – many of whom are now facing corporate fines but few individuals are facing prison). We should have a transparency law operating in all jurisdictions (similar to the country-by-country reporting) which would require multi-nationals to declare their sales in every country in which they do business, an end to tax havens and secrecy, real Directors allowed to operate companies, an end to the transfer of funds of PEP’s (politically exposed persons who operate with impunity and take billions out of countries desperate for the money they transfer into their own accounts) and a general set of legal requirements which ban artificial tax avoidance schemes. I was at two contrasting events this week that provided strong connections. The first was the Annual Prize Giving at Ashmole Academy, where I am Chair of Governors / Directors. Our guest of honour was Professor A C (Anthony) Grayling – one of this country’s best-known philosophers and writer on ethics through books such as “Liberty in the Age of Terror”. He has also recently opened the New College of the Humanities (NCH) in London – a new private university. The second was the inaugural meeting of the Board of Directors of Future Brilliance Limited – a not-for-profit set up by Sophia Swire, a courageous and hugely talented woman who has spent much of her life working to improve the lives of Afghans. Future Brilliance – Afghanistan has already begun work to provide business skills training and business opportunities to young Afghans and has a focus on especially improving access to woman for education and business in Afghanistan. The concept of “equal concern” for all is not about providing everyone with the same standard of living but a desire to provide everyone with the same opportunities. It is up to the individual how they exploit those opportunities. Anthony Grayling gave an excellent talk to our students. He described how we only have around 1,000 months to live and 2/3rds are spent sleeping and shopping or similar. That leaves just 1/3rd of our lives to do something meaningful. He believes that we should use our time in education to broaden our knowledge, ask questions, to develop the enquiring mind. This was brought home by Sir James Dyson’s comments about education – where he decried the reading of French lesbian poetry as his example of a liberal, humanities-based education rather than one focused on science and engineering. Michael Gove defended the former. Anthony Grayling provided a very good set of reasons for ensuring that the humanities gain equal concern. At Ashmole Academy, we have developed the ability to help students pass the exams they need and at the right level to gain acceptance to Russell Group Universities (and a large percentage do this in science and maths) but also produce individuals ready and equipped to face the world. Ashmole is non-selective and provides equal concern for all students – providing that equality of opportunities that gives everyone a fair start in making something of their lives. If only that was true of the whole education system in this country – where there is a major disparity between independent (alpha schools) and maintained sectors (although we believe Ashmole now challenges that assertion) and between good maintained schools (beta) and those who struggle (epsilon) for any number of reasons – see https://jeffkaye.wordpress.com/2012/05/13/the-fight-over-education/ We do not have equal concern yet borne out by the equality of opportunity. However, in the UK we are blessed when compared to the range of destructive problems that exist in countries like Afghanistan. The problems are well known but the solutions are tough to consider let alone implement. In 2014, US and UK troops are expected to leave and it is there will be a major exodus of the brightest and best as the Taliban threat grows. Sophia Swire has been working in Afghanistan for some time to improve the lives of those working to make the most of their lives. I met her at Global Witness – an anti-corruption NGO – when she was working with the World Bank. The Future Brilliance task is to develop young Afghans to benefit from the huge potential that their natural resources offer them by building their skills and business base within a code of ethics and good governance. The US and UK are now working to provide financing in the next two years to help this process before they pullout – to work to get traction amongst the people who have been traumatised by the Taliban and by war and, to an extent, by aid programmes. What is clear is that the country is also beset by corruption and a weariness that people struggle to shake off. This weariness is because the various governing classes, whether politicians, tribal chiefs or Taliban, have a view of leadership that we find out of date. There is no equality of concern. Concern is primarily for those already in leadership positions and a country that develops this manner of leadership will not break out from its current trauma. Beyond this, of course, Afghanistan has a view of women (in general) that we see as 16th Century. Religion-blamed customs keep women from education and business in most cases. Like Malala, the young girl shot by terrorists in Pakistan, young women struggle to be allowed any freedoms – whether for the right to be educated or to enter into business. Again, customs deny equal concern for its citizens. As A C Grayling highlighted in his book “Liberty in the age of Terror”, in the West, we have fought hard for centuries to secure basic human freedoms such as those enshrined in the Universal Declaration of Human Rights. In this country, we have witnessed the strain that terrorism has wrought as freedoms have been whittled away for the cause of security. But, human rights have to be based on equal concern for all. In a world that is now so interlinked, it is impossible to close our eyes at the problems in other countries. To a large extent, their problems are ours. Terrorism affects us in the UK in heavier security that reduces our freedoms. It is better to also work towards improvements in those countries where terrorism is bred. Acknowledgement human rights and of economic improvement are crucial not via handouts and aid (except in emergencies) but through the use of focused assistance to bolster the ability to help themselves and to relentlessly work to rid the country of corruption. To succeed, government has to show equal concern for all its citizens – to provide the fair start – and it has to start with education (both boys and girls) and lead into business and wider, governmental responsibilities. Investigative Journalism is in grave danger. As the immense and chaotic growth of the internet has trampled on the incomes of newspapers and TV stations, the amount of space, time, thought, people, knowledge and experience within the IJ profession has dwindled. Newspapers have closed (at a local and national level) in most countries where open societies are dependent on the so-called Fourth Estate (the printed press) to keep the other three Estates to book. Burke’s Fourth Estate (from Thomas Carlyle in 1787 – “Burke said there were Three Estates in Parliament; but, in the Reporters’ Gallery yonder, there sat a Fourth Estate more important far than they all.”) is now at risk of complete melt-down as we transition from the mogul-dominated press (now represented by Murdoch’s News International and the like) to the more widely-available online environment. There is a continual blurring of the press – all the way from the WSJ and the Times, through investigative NGO’s and not-for-profits like Avaaz, the Bureau of Investigative Journalism and Global Witness, to blogs and twitter. The Fourth Estate is now a seething mix of intelligent news, variable comment and juvenile rant. Intelligence and knowledge is often lost in the morass of popular discussion. In the UK, the Jimmy Savile problems at the BBC have been exaggerated by the imbecilic lack of editorial and investigative journalism at its flagship Newsnight programme – which has now seen the resignation of George Entwistle, the Director General (only for 55 days). It is entirely credible to believe that the problems at the BBC have been caused by substantial cost reductions and more focus on bureaucracy than investigative journalism and editorial nous. Its dependence on the Bureau of Investigative Journalism (itself set-up to counter the dramatic fall-off in newspaper funding and initially funded by £2m from the David and Elaine Potter Foundation – a charitable foundation) has been found wanting and it has suspended all work with the BIJ. In the past, the BBC would fund its own operations and its focus on only providing evidentially supported material would have been sharp as a knife. The BBC is a symptom of the wider problem facing investigative journalism worldwide. Even though it is a public sector organization, it is hardly immune from cost cutting and a focus on keeping the license fee down (each TV user in the UK pays a license fee which funds the BBC). This has meant job losses and a looser grip on key, operational knowledge and expertise that shows itself clearly in situations like this. There was a great scene in an episode of the US hit “Boardwalk Empire” recently when Gyp Rosetti (a violent Sicilian gangster) is brought a newspaper by a young vendor and screams – “but, this is yesterday’s news!”. The frightened newspaper seller eventually sees the joke – of course it is – that’s what newspapers write about. His life is spared. Unfortunately, the 21st Century has become more about what is happening now rather than analysis of what happened yesterday. The internet and 24 hour news on TV is less analysis and more about currency – being up-to-date with whatever is the latest news. Newspapers and TV current affairs programming are now challenged by the rest of society – which is more concerned with being current than having good analysis; more about celebrity than intelligent reporting. Yesterday’s news has less appeal to those who are more intent on living for today and the internet has, unfortunately, enabled this movement. The internet is a vast machine that, when used well provides enormous gain. When used badly, it provides enormous harm. When this is linked to lazy journalism by those who should know better, disaster strikes. This was the case when ITV’s Phillip Schofield ambushed David Cameron on “This Morning”, their flagship morning TV show. Having gleaned names of supposed pedophiles from Twitter, Schofield presented these in a printed list to Cameron on live TV – some of the names were then visible on air and led to reports on Twitter and exposure of names that were later shown to be innocent. This led to the Newsnight expose and a potential £1m lawsuit. This amalgam of the internet and lazy reporting by those who should know better – compounded time after time – is leading to a public (already embittered by the Leveson phone hacking enquiry) to misbelieve those journals and honoured current affairs programmes to the extent that the Fourth Estate (the part of the media profession that should be holding to account the legislature, executive and judiciary) is now ridiculed along with bankers. Following the revelations of phone hacking in the UK and the BBC disasters, good, investigative journalism has been shown in its desire to compete (phone hacking was a competition for sales) and its lack of funding to be seriously broken. The ability of the Fourth Estate to provide serious, intelligent, brave reporting that can be believed in is a core ingredient to any open society. There is more at stake than a few journalists. This is about how civil society holds government and large organisations to account – how we hold society to account. Dictatorships of all kinds seek to diminish and destroy the Fourth Estate. From the capture of newspapers by moguls to the silencing of opposition in countries from Africa to China, the State and large organisations seek to capture information. Those who are clammering for more control over the media in the UK (a reaction to good media coverage of the expenses “scandals” in the UK) want to manage the media. The repercussions of this, on top of the already financially ravaged media, will be a continuous erosion in the ability of the media to hold our institutions to account. It will leave this to NGO’s who are too small to impact except at the margins and to the internet – with its chaotic and wide (not deep) intelligence. The role of investigative journalism – its ability to hold society and our major institutions to account – should be as sacrosanct as democracy. It is a vital part of democracy but the part now most at risk. In the UK, the BBC is a serious leg of the Fourth Estate that has become rotten. Our newspapers are lessened through time (they have smaller budgets, less staff, less foreign correspondents). “Money talks” and nowhere more than in investigative journalism – where Chinese, Russian broadcasting and Al Jazeera now have the deepest pockets. If we want an intelligent media that can hold us to account and in which we believe, then we have to fund it. When challenged by the mayhem during this transition to online media and the mass of opportunity provided by the internet, we should seek to understand that the news media is not just about what is happening to celebrities but that there are issues of balance that underpin the freedoms on which we rely. Those freedoms – the right to free speech amongst them – are underpinned by a well-run and financed Fourth Estate. While the UK is mired in public investigations of phone hacking and concern about the BBC, perhaps the western world needs to consider what has been happening to its investigative journalism over the last twenty or so years. The rapid decline in reporting and the esteem in which the previously recognized media was held may be a mirror on society but does threaten to destabilize society, The possible demise of Newsnight and the continuous dumbing down of journalism is maybe what we deserve but not what we should crave. The Potter Foundation bravely invested in a response through the BIJ. It would be a shame if the BIJ lost that credibility now. The BBC has built itself into a tower of independent, journalistic credibility. Who else but the BBC would have carried out the interview yesterday (on its radio 4 programme “Today” between John Humphreys and Entwistle) that effectively caused the Director General to resign? That tower is toppling, though. All that are not just interested in democracy but so enraged that the whole edifice may be crumbling as investigative journalism is left to the wolves will be disheartened but it is now time to pick up the pieces and ensure that this is the low point below which it should not go. 21st Century democracy needs a vibrant investigative journalism to hold it to account through the mass of information that is available – a sabre rather than an axe. Maybe the recent problems will be seen as the opportunity to save the Fourth Estate rather than allow it to be sold off. We have recently heard how HSBC have been guilty of extraordinary money laundering that allowed the corrupt and the criminals to export “their” money around the world with impunity. We are also told by the Tax Justice Network that tax havens contain over $21 trillion of funds – much of that the result of money laundering, all of it hidden from sight. Money flows around the world in amounts that make ordinary people dizzy – yet, governments are scared to remedy the essential problem that the “hear no evil, see no evil, speak no evil” banks and the laws that allow tax havens permit: at best, a gross distortion of the economic well-being of the vast majority (99.5% or more) of us that don’t work the system; at worst, a criminal shadow state that has the power to dictate our lives because of its financial muscle. US Senator Carl Levin called HSBC misdeeds “stunningly unacceptable”. The broad acceptance that money can flow around the banking system no matter where it comes from and no matter where it is going strikes at the heart of a system mired in 19th Century but caught up in the plundering of the 21st. Mexican drug cartels have (amongst many others) been able to syphon billions of dollars of their income (derived through murder and extortion and leading to the deaths of thousands, the misery of hundreds of thousands and the cost of those nations where demand for their drugs exist) as if they were the local car rental firm. Regulators (see: http://www.telegraph.co.uk/finance/newsbysector/banksandfinance/9413299/HSBC-money-laundering-where-was-the-regulator.html) were inept at …regulating. The laws were broken time and time again and there is no question that HSBC’s guilt is equivalent to a conspiracy to flout the legal system. As the Senate investigation found, between 2007 and 2008 there was around $7bn moved from Mexico into the US via HSBC. Mexican authorities pointed out to regulators and the bank that this was highly suspicious but no action was taken. Above this, banks in Saudi Arabia and Bangladesh were provided with accounts despite their alleged terrorist connections. This deception by the banks – where they know all the problems that being found out would cause – cannot be deemed to be a simple error of judgment. The dark deception practiced by HSBC goes to the very core of not just banking but the whole way nations work. HSBC has torn at the very heart of natural justice and ethics by thinking that the banking system is, somehow, not part of the world. The flow of money to them is something else – not the prime culprit and with no one hurt by their deceitful acts. They are, of course, completely wrong! Banks’ dark deception is the same deception as any launderer of stolen goods. While we prosecute the small criminals, the huge criminal acts are allowed to escape. This costs us all. How? Without the ability to transfer their huge “wealth”, drug traffickers, corrupt politicians, the mafia and the rest would not be able to use that “wealth”. If an Angolan politician (and I use that country as an example advisedly) wants to gain any benefit from the oil wealth generated and passed into his or her bank account in Angola, the money has to be transferred to another country – somewhere that money can be invested or to buy goods (like mansions or yachts) that effectively launders that money. When Denis Christel Sassou-N’Guesso, the son of the President of the Congo, was shown by Global Witness in 2007 to have spent $35,000 on designer goods and other items (and went to court with them and lost), it may have seemed trivial – even to someone who earns much less than that a year from his “job” in his country. When he failed to pay his court costs, I had to pursue him into France (I was working with Global Witness at the time) and we found his expensive apartments in Paris and threatened him with bailiffs. He paid up! But, how did he get his money out from a country where the vast majority is completely impoverished – under $2 a day income? Through the banks, of course. Banks that are supposed to take account of PEP’s – politically exposed persons – and run checks on them to ensure that the money is obtained properly. So, money flows without barriers around the world – banks appear oblivious to the terrors that their inactions cause. Of course, our guardians are supposed to be the regulators – people and systems entrusted by the “free world” to guard us against the corruption of the banking system. Under the framework of the Financial Action Task Force – FATF (see: http://www.fatf-gafi.org/pages/aboutus/) we are supposed to be provided with safety. It is up to each country to develop its own safeguards and laws, but the system is failing. FATF make recommendations and while they have in recent years opened themselves up to more scrutiny and NGO participation, they are slow to act as any centralized, world organization can be. If FATF was working, then the HSBC’s “stunningly unacceptable” inactions would not have occurred. In each country, the laws and practices are separately developed. The US regulation of HSBC has been found to be appalling. The Office of the Comptroller of the Currency (OCC) had 50 investigations into HSBC between 2005 and 2010 in areas of anti-money laundering and found 80 problem areas. However, in not one of those cases did it require any major changes to take place. This laissez-faire attitude to such a serious problem again strikes at the heart of governance – banking and nation. This then means that the Compliance management system within the bank was flawed and unable to resist the calls to make money. Compliance officers are weak and under pressure from the moneymaking machine that is the bank. The fact that David Bagley (HSBC’s Head of Compliance) resigned from his role is no surprise – who knows that he will remain in HSBC in a different role???? So, failure at international level (FATF); failure at national level (OCC); failure at HSBC (Bagley) – the whole system is designed to fail and meets that objective. If that was all, it would be bad enough, but it gets so much worse. The Tax Justice Network reports that $21 trillion is held in tax havens. Anyone who had read Nicholas Shaxson’s excellent book – Treasure Islands (http://www.amazon.co.uk/Treasure-Islands-Havens-Stole-World/dp/0099541726/ref=sr_1_2?ie=UTF8&qid=1342962917&sr=8-2) will be familiar with how dark and dangerous the world’s elicit affair with tax havens is. $21 trillion of unseen “wealth” is stored away from taxation and from sight. The USA and UK are especially complicit in this as the UK has its own tax havens in London, Jersey, Guernsey and its protectorates in places like the Cayman Islands. Because it supposedly provides wealth to important people who influence our affairs, successive UK governments have been scared to interfere. Recently, as much to do with the involvement of the Liberal Democrats in government as anything, small steps have been started to end many tax avoidance schemes and the use of moral judgment has entered our language. This is causing such a fuss that the good citizens of Jersey are threatening to break off from the UK – horror of horrors. It is but a small start. The USA is not exempt from blame as Shaxson shows so well. Delaware – the Blue Sky State – makes its money from tax evasion. Offices in Delaware are home to hundreds of companies located there for tax reasons. This costs us (the 99.5% who don’t have the opportunity to avoid tax in this way) a fortune. We end up with higher VAT, higher social security, higher income tax, corporation tax, inheritance tax and other sales taxes as a result. This gargantuan sum is difficult to comprehend, but it becomes more understandable at a parochial level. According to an earlier report by the PCS union, the Tax Justice Network and War on Want, the use of tax havens costs the UK taxpayer at least £16bn a year, double the annual budget of the Department for International Development. The confluence of the HSBC horrors combined with the system of tax havens that operate is of a worldwide network of money flows that are outside the law and jurisdictions. While we berate the investment banks for their sub-prime disasters of 2007 and for Diamond’s culture problems at Barclays, the basic banking systems are at fault in a worse way. For, it is basic banking on which we trust to get money from one account to another. Nat West’s recent debacle in the UK, when its IT systems went haywire, shows what can happen when the basic system goes wrong. How much worse it is when the basic system of banking and our international management of that system and to where we allow money to flow is completely abhorrent – it is a very dirty hell-hole that allows bad money to flow wherever it wants and to wherever it wants. The international banks are not just bystanders in this – they are culpable and implicit in crime, in corruption and in impoverishing millions (and making all of us poorer). Banks have had a very bad press but in the 21st Century as digital technology rules our lives, it is too easy for banks and their staff to evade controls. FATF should have teeth and should be allowed to go beyond recommendation to sanctions. National governments should ensure that their OCC equivalents are given the means (financially, technically and with highly skilled and well-paid management) to do the job. Compliance Managers in banks should have complete independence from their senior management and be subject to independent audit (outside the main financial audit and by different audit firms). Independence means that they should report to compliance board which, in banks, should have independence from the main Board and include only non-execs. Tax havens should be outlawed – tax should be payable where profits are made and any scheme set up to avoid tax should be illegal. We have made a very small start in the UK- but only a tiny one. The moral crusade which happens at a time of worldwide recession is the time to get this in motion so that money can no longer flow illicitly and quietly. How do we contribute to society and how do we influence the future? Campaign organisations are also full of careerists who work their way up the system internally and may have little real association with society outside their own silo of interest. Corporations (especially large, multinationals) have a tremendous power in a world dominated by numbers – growth objectives – and can fund large campaigning groups of their own. There is no equilibrium in society although it feels like stasis has been reached. Different bodies are continually evolving as the environment changes politically and socially and economically. The problem is that entrenched interest groups (drawn from those sectors above) continuously work to make their positions more secure. But, mainstream sectors have succeeded, in the main, in wrapping the first three groups into that mainstream. There is a dependency on each other and a difficulty in breaking through with new ideas and attempting to force through decisions on even the most important issues. The global economy has exacerbated this problem – as international needs lead to massive international organisations that succeed always in taking decision-making away from the individual. Improved communications have through history succeeded in transforming the ability of individuals to learn more and have a greater say. The printing press was followed by the telephone, which was followed by the fax machine and the mobile telephone and the internet. Mass communication is now available that provides the ability for all of us to understand more of what is being done in our name. Social systems such as Twitter enable communication in an instant; mobile telephony and digital technology allows information in microseconds. This has had repercussions in events like the Arab Spring but the rigidity of social norms fights back most often. Society’s complex underpinning will see some new emergence develop from this – but, what is it likely to be and how can the individual become involved rather than be part of a sector that more clearly matches that of Orwell or Huxley’s nightmares? Maybe it’s a natural occurrence – that as organisations develop, they coalesce and form groups and associations that begin to meld into international committees that appear completely remote from most of us. This is certainly true of political parties, true of sports associations (like FIFA or the International Olympic Committee), true of international organisations (like the UN, WTO), major NGO’s and charities, political groupings such as the EU, international corporates (such as the banks). Most people don’t know most of these organisations and many (like FATF – the Financial Action Task Force) have for years seemingly gloried in their anonymity. With the rise of the internet, we were meant to discover more but that same rise has meant that less spending goes into traditional media organisations like campaigning newspapers. This has meant a reduction in in-depth investigations and analysis and much-reduced investment by newspapers and other media outlets in providing the type of information we need as individuals in society to keep the massive organisations on their toes. In a major sense, the rise of the internet has had consequences that were not envisaged and has led to a major centralization of power structures – more immune from investigation than before. We must not be misled by the closure of the News of the World in the UK after the hacking enquiry – the NotW was a scandal rag that was part of the new world of celebrity. Its loss is not great. The loss of whole departments where the main task was to investigate and analyse how society works (and where it does not) and the rise of the internet as a news medium (and comment in 140 characters) shows that, so far, what has emerged is leading to centralization not the reverse. Democratic society is supposed to provide individuals with the ability to influence the way our society is run. So, centralized control does affect us all. While the drive to consumerism may suggest that we would not mind if we were ruled like in China (more goods supplied to keep the population quite), I suspect that this tendency does not appeal to all of us. Centralised control does not stop at Tiananmen Square – it has no controls. “”Unlimited power is apt to corrupt the minds of those who possess it” (William Pitt the Elder) is borne out through history and the idea that we can allow others complete freedom to guide us through life is obnoxious to most of us I suspect. What are the options for decentralising? The centralization of sectors of society needs to be continuously prodded. That can be done both internally (i.e. within those instruments of power) but mainly externally (from other organisations and / or individuals). Working within is tough – the structures bind staff to their culture and it is very difficult to break out. A feature of British politics has been how the Liberal Party (a party for the individual within a coherent society and always opposed to centralization and totalitarianism) has become (especially since it became the Liberal Democrats) so bound up with the EU project – a centralizing force that is now seen to be breaking up. External pressure may now be the only way to elicit change and to change the environment so that something less centralized can emerge. All such organisations are set up to prod (some quite heavily) the existing structures – they are all dependent on external funding. We need some creative destructionism – in the same way that Apple created new products that tore at our desire for more than pure functionality (although Apple is now part of that central structure); in the same way that Google tore into the online world and is now a core of that central structure – within the non-economic sphere, the way we live outside of numbers and products. There are some options that remain that can assist in developing society so that we learn the lessons of the 20th Century – where communism and fascism drove the world to and then away from totalitarianism. Those lessons are now in danger of being unlearned – where the danger of unbridled centralism of society is occurring without (thankfully) war, but just the same potential results. We could wake up and find the world run from the centre. Maybe it is already and the drift to unequal wealth distribution a symptom. That suggests more of an effort is needed to point a finger at our structures and the best way to do this is through our participation – and through some independent organisations, especially in investigative journalism, which can expose, fight for freedom of speech, help to analyse the impact of centralised decisions on society and expose fraud and corruption: many groups, many individuals wanting to open up the closed doors. Does a tree that falls in a forest make a noise?